Veneto (pronounced [ˈvɛːneto], Laitin: Venetia, Venetian: Vèneto) is ane o the 20 regions o Italy. Its population is aboot 5 million, rankin 5t in Italy. Veneto haed been for mair than a millennium an independent state, the Republic o Venice, till it wis eventually annexed bi Italy in 1866 efter brief Austrian an French rule. Its capital was, and still is, Venice, which ruled for centuries ane o the lairgest an richest maritime republics an trade empires in the warld. Due tae this rich cultural legacy, a significant number o Venetians consider thairsels tae hae a unique identity which they refuse tae subsume athin the notion o "Italian", an the regional govrenment haes gane so far as tae offeecially define its inhabitants as "a fowk". This opened the wey tae a notable naitionalist muivement an tae the election o a "Venetian naitionalist", Luca Zaia (Liga Veneta–Lega Nord), as preses o the Region in 2010. Ance the hertland o the Venetian Republic, Veneto is the day amang the walthiest, maist developit an industrialised regions o Italy. Haein ane o the kintra's richest historical, natural, airtistic, cultural, muisical an culinary heritages, it is an aw ane o the maist visitit regions o Italy, wi aboot 60 million tourists ivery year (2007). Besides Italian, maist inhabitants an aw speak Venetian. 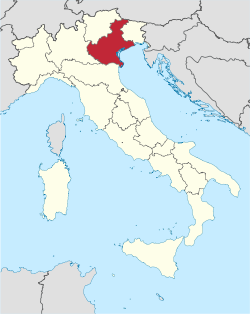 Haein been for a lang period in history a land o mass emigration, Veneto is the day ane o the greatest immigrant-receivin regions in the kintra, wi 454,453 foreigners (9.30% o the regional population). Veneto is dividit intae 7 provinces an 581 municipalities. ↑ "Statistiche demografiche ISTAT". Demo.istat.it. Retrieved 2010-04-24. ↑ "Consiglio Regionale Veneto - Leggi Regionali". Consiglioveneto.it. Retrieved 2010-04-24. ↑ "Statistical Report 2007 - Chapter 1.2 - Production sectors". Statistica.regione.veneto.it. Retrieved 2009-05-06. ↑ "Veneto in numbers: statistics pocket-guide: Year 2007". Regione del Veneto Department for Statistics. 2008. Archived frae the oreeginal on 10 July 2009. Retrieved 9 June 2009. ↑ "Appendice: Tavole anagrafiche: Tavola I – Comuni del Veneto: superficie, densità, altimetria, zona altimetrica, aggregazione territoriale (Ulss, Stl, Comunità montane): 2007" (in Italian). Regione del Veneto Sistema Statistico Regionale. 2008. Archived frae the oreeginal on 1 June 2009. Retrieved 9 June 2009. Wikimedia Commons haes media relatit tae Veneto. This page wis last eeditit on 22 Apryle 2018, at 23:31.